Sometimes when dogs get older and need meds. taking care of them becomes very difficult for the parent. We have had several of these precious older sweethearts stay with us in the past. Parents and family members come and visit when they want to and are assured that we are doing everything necessary to make their senior doggie happy and comfortable. We have a special love for senior dogs with four of our own over 12 years old! No dogs are ever alone here so we can watch and make sure each one is doing great. Benny was our first hospice dog. His Mom traveled all of the time and she couldn’t take care of him in his senior years. Benny came to stay with us and we emailed pictures and updates about him to his Mom when she toured Europe. 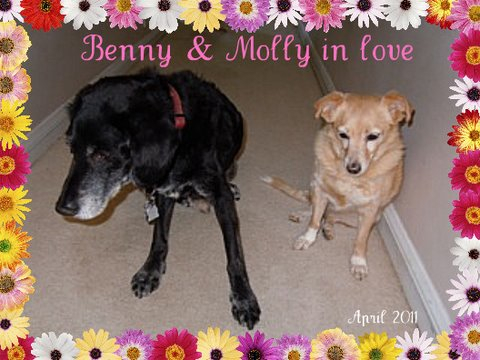 Benny was 16 and even fell in love with our Molly (Molly is now 14! ), proving that quality of life can last forever! Along came Mini! Mini was 15 when she came to us. She still wanted to go to the annual Howl-O-Ween event in Simi Valley. 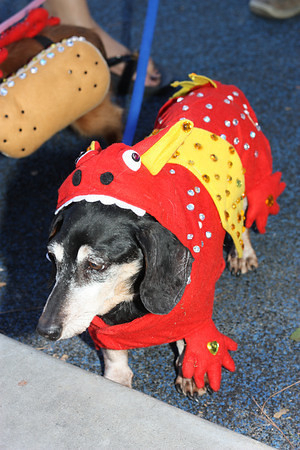 Mini, (a doxie), wore her costume with pride! Every morning Mini would follow me into the kitchen and I would cook her egg. She liked it mixed with bread or rice. Mini kept me on my toes planning her menus. She never wanted the same thing twice and spent the last years of her life eating steak, chicken, and fish! Plenty of people commented on how they would like to eat as well as Mini. It was my pleasure. Mini recently crossed the rainbow bridge at the ripe old age of 18! Doggies in hospice still enjoy having fun. Marissa and I both are experienced in giving shots and cook special meals for special pups! If you are interested in this service please contact us for more information.